The BMW ActiveHybrid 3 is a gasoline-electric hybrid model in BMW’s 3-Series lineup of entry level luxury sedans. The German performance and luxury manufacturer’s 3-Series is in its sixth generation as of the 2013 model year; the generation was introduced in 2011. The BMW ActiveHybrid 3 is based on the sixth generation of the BMW 335i. It premiered at the North American International Auto Show in Detroit in January of 2012, and became available in the United States that fall as a 2013 model year car. The ActiveHybrid 3 is assembled at a BMW production facility in Munich, Germany. The ActiveHybrid 3 joins two larger siblings, the ActiveHybrid 5, which was also released in 2013, and the ActiveHybrid 7, which became available in 2012. The gasoline engine in the ActiveHybrid 3 is the same as the powerplant found in the BMW 335i, a 3-liter turbocharged six-cylinder. However, BMW added a 40kW electric motor to the engine and a lithium-ion battery pack under the cargo hold, and matched it all to an eight-speed automatic Steptronic transmission. The drivetrain’s combined power yield is 335 horsepower. The BMW ActiveHybrid 3 boasts a 0-60 acceleration time of 5.2 seconds and has a top speed of 155 miles per hour. The Environmental Protection Agency’s fuel economy ratings for the ActiveHybrid 3 are 25 miles per gallon city, 33 miles per gallon highway, and 28 miles per gallon combined. The ActiveHybrid 3 can travel on electric power for 2.5 miles, and in electric mode, is capable of a top speed of 47 miles per hour. Drivers can monitor their fuel usage and electric reserves on BMW’s iDrive information control system. In addition to gas mileage statistics, the console also displays how much of the engine’s power has been used. The ActiveHybrid 3’s drivetrain is engineered so that at high speeds, the vehicle can coast with the gasoline engine turned off when the driver is not mashing the throttle, making good and efficient use of the vehicle’s electric capabilities. The BMW ActiveHybrid 3 can be driven in several different settings via the driving dynamics system. Eco Pro is for ultimate fuel savings, which works by tuning down throttle response, making the transmission shift earlier, using an active cruise control system for optimized efficiency, and offering driving advice on the control screen. Comfort adjusts ride quality on rough terrain, and enables full functionality of the electric and power accessories, which might otherwise be compromised when the car is maxing out its electric power usage. Sport mode functions based on a delicate balance between electric power and gasoline power so the driving experience doesn’t suffer for the sake of fuel economy. 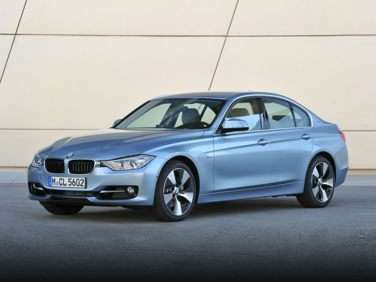 Potential buyers who comparison shop between the ActiveHybrid 3 and other 3-Series models will notice that, other than features that are specific to the gasoline-electric hybrid drivetrain, the BMW ActiveHybrid 3 is very similar in fit and finish to the BMW 335i. Hybrid-specific badging and aerodynamic design details are subtle, and the car can be configured with many of the same package options as the 335i, such as upgraded interior materials and custom trim, a navigation system, a rear view camera, park assist, Bluetooth wireless integration and real time traffic information display.